We are delighted to announce that we are now accepting workshop proposals for Epic Skill Swap 2018! As of today, you may now request workshops that you would like to take and propose workshops that you would like to teach via our skill submission site: skills.epicskillswap.org. Those of you who have Swapped in the past know that this process, like all of Skill Swap, is participatory. Here’s a description of the process. Whether or not you have led a workshop before, we suggest you take a look at our resources for workshop leaders page with tips for leaders to consider as you develop your workshop proposal. We can’t wait to see what you all come up with this year! P.S. If you’d like to start a conversation about a workshop idea, you can also head over to our new ESS facebook group, which we’ve set up to facilitate discussion about Skill Swap throughout the year. You can also RSVP to the weekend at our Facebook event. This entry was posted in Uncategorized on February 15, 2018 by Dana Dwinell-Yardley. 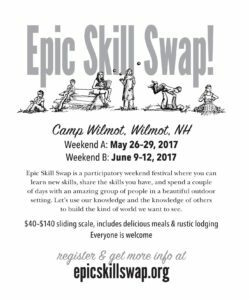 February is cold and snowy here in New England — and it’s also the perfect time to think about what you want to teach and learn at Epic Skill Swap 2018, which will take place June 1-4. Those of you who have attended ESS in the past will know that our process for workshop selection is participatory. Who can propose or request a workshop skill? You can! Through our skill submission website, you will be able to request workshops that you would like to take and propose workshops that you would like to teach. We hope you’re excited about swapping some skills, because this is about to get awesome. The workshop/skill submission site will open next Thursday, February 15, 2018. (You can see last year’s proposals and requests at skills.epicskillswap.org). You, the ESS community, will then have one month to propose and request workshops. Check back in, as someone may request a skill that you can share! Submissions close on March 15. Between March 15–29, you’ll have 2 weeks to vote on which of the proposed workshops you are most interested in, using the same site (you’ll get an email about this too). Shortly after March 29, our scheduling team will be in touch with workshop instructors. The schedule will be finalized by early April, which is also when we’ll open registration. Then we’ll prepare for a weekend of skills, sharing, music, playing outside, conversation and community. On June 1-4, 2018, we will undertake skill-swapping and merrymaking with glee and gusto. P.S. Want to let us know you’re coming, or invite a friend (hint, hint)? RSVP on the Facebook event for ESS 2018. If you’d like to start a conversation about a workshop idea, you can also head over to our new ESS Facebook group, which we’ve set up to facilitate discussion about Skill Swap throughout the year. This entry was posted in Uncategorized on February 8, 2018 by Dana Dwinell-Yardley. We, the ESS organizing team, have some news to share with you all: Due to low registration for Weekend A (May 26-29) and overall lower numbers signed up this year, we have decided to cancel ESS Weekend A. After deliberation and helpful feedback from folks registered for the first weekend, it was clear to us that it will be better for this year’s and future events to pour our energy and resources as a community and as a committee into one epic weekend. We are sending a separate email today to those registered for Weekend A with instructions for cancelling (with full refunds, of course) or changing their registration, and we hope and anticipate that many will be able to join us for Weekend B instead, which will mean an even more full and vibrant weekend for all! Don’t forget, registration is still open for Weekend B (June 9-12)! The draft schedule may change a bit as we incorporate migratory workshops from Weekend A, but never fear, the weekend will still allow for all the planned workshops, late additions, and relaxing/singing/storytelling/swimming/napping/socializing you’ve been looking forward to. Please do continue to spread the word and grow the community! We are really bummed to have to make the difficult decision to consolidate the weekends, but grateful as always for the enthusiasm, thoughtfulness, and support of this amazing community. 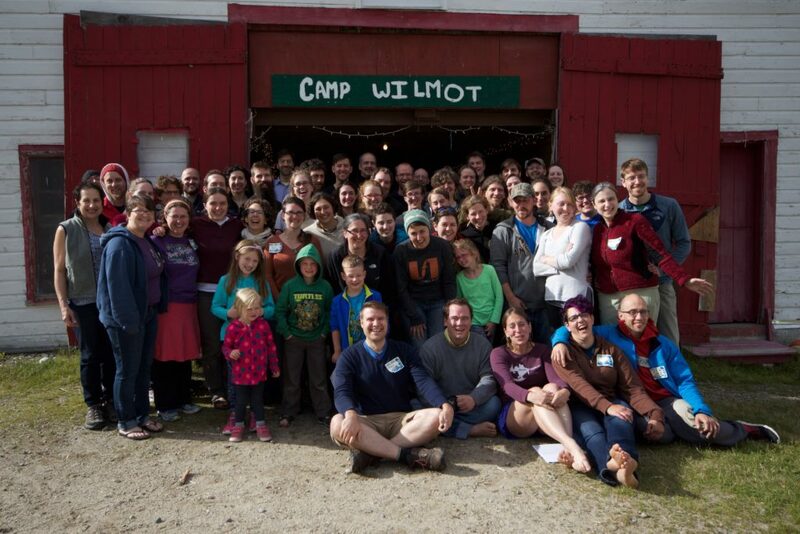 And we are REALLY excited to see everyone who can make it to Epic Skill Swap 2017, June 9-12 at Camp Wilmot! All-camp photo from Weekend B 2016. This entry was posted in Uncategorized on May 16, 2017 by Dana Dwinell-Yardley. “Help! Which weekend should I register for?” Here’s what Eliza has to say. 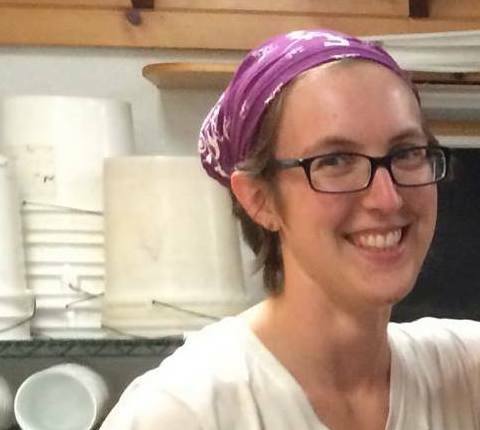 My name is Eliza, and I’m the newest member of the ESS organizing committee. I’m writing to ask a favor: If you’re planning on attending Epic Skill Swap this year, it would be extraordinarily helpful to us if you would register ASAP. This will help us to do our planning (and will also ease our minds a little, since the cost of Skill Swap is split among the attendees, and so the more people we have registered, the more affordable ESS is for everyone). Additionally, I wanted to address something about the two weekend model that we adopted last year: ESS Weekend A and ESS Weekend B are not quite the same. The nature of Skill Swap is that the experience is formed by the people who attend. The organizers aren’t trying to manicure two identical weekends, and so each weekend is always unique. For example, you may have noticed that this year, Weekend A has fewer workshops on the schedule than Weekend B. Put another way, Weekend A has more space to evolve as it happens. If you didn’t get a chance to propose a workshop, or if you proposed two workshops and one was not selected, you can (and we think should!) bring that workshop to Weekend A! Speaking from my experience last year, a weekend that evolves as it goes is a really cool experience. Weekend B will also be cool and have some space for last-minute workshop additions, but will probably be a little more structured and predictable. If the idea that the two weekend are going to be different is just killing you, because you don’t want to miss out on either experience, why not come to both? (Remember, we have a sliding cost scale!) If that’s not an option, but you haven’t decided which weekend to attend, then we ask that you consider attending Weekend A, which will need lots of cool attendees with great ideas to help fill in all those inviting open workshop slots! Please also remember to share the wonders of Skill Swap with your friends and networks! If you know someone who would just love ESS, now is the time to send them the link to the registration page! With Skill Swap it’s not just “the more the merrier.” It’s that as a community, we are greater than the sum of our parts, and the more parts, the greater the whole. We can’t wait to see you at Epic Skill Swap 2017! This entry was posted in Uncategorized on May 2, 2017 by Dana Dwinell-Yardley. Epic poster, epic registration, and more! We want to remind you that registration for Epic Skill Swap 2017 is OPEN. If you have not yet registered, go do it! Now that you’ve registered, please help us spread the word about Skill Swap! Poster: We’ve designed a nifty poster and postcards that you can put at your local grocery store, coffee shop, dance hall, or community center. Click here to download the poster (PDF), and click here to download the postcards (PDF, 4 to a sheet). I’m writing to invite you to an awesome event: Epic Skill Swap 2017! Epic Skill Swap is a participatory weekend festival where you can learn new skills, share the skills you have, and spend a couple days with an amazing group of people. Let’s use our knowledge and the knowledge of others to build the kind of world we want to see. There are two weekends to choose from: May 26–29 and June 9–12. Cost: $40–$140 sliding scale, includes delicious meals and rustic accommodations. Location: Wilmot, NH. Register, check out the list of workshops, and learn more at epicskillswap.org. Questions? Email the organizers at epicskillswap@gmail.com. Facebook: It helps a lot when you share or invite friends and RSVP to our Facebook events: Weekend A and Weekend B. This is also a good place to ask questions or communicate with other swappers ahead of time. Looking forward to two epic weekends! This entry was posted in Uncategorized on April 20, 2017 by Dana Dwinell-Yardley.